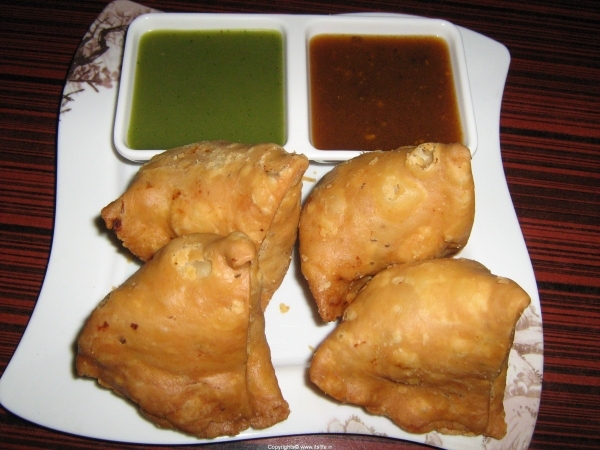 Samosas are a deep fried conical shaped pastry stuffed with Potatoes and spices. It is the most popular snack in India. Mix the ingredients with water to a soft dough. Knead the dough well. Cover the dough with a wet cloth and leave it aside for 15 to 30 minutes. Heat Oil and add Cumin Seeds, Coriander Seeds, Aniseed, and Chilies. 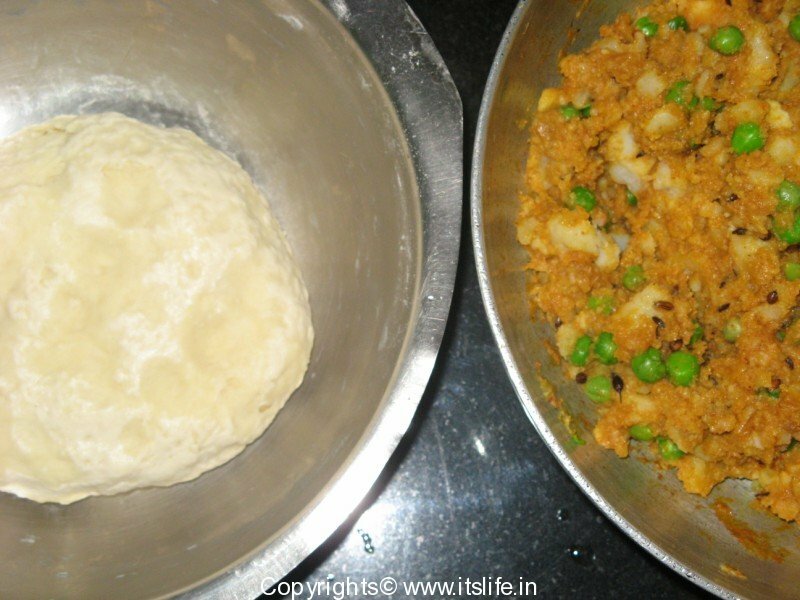 Add Green Peas, Mashed Potatoes, Salt and mix well. Add Coriander, Chili and Aamchur Powder and mix well. Let the mixture cool. Make a paste of 1tbsp Maida and 1tbsp water and keep it aside. Divide the dough into lemon size balls. Roll out each ball into a circle and cut the circle in the middle. 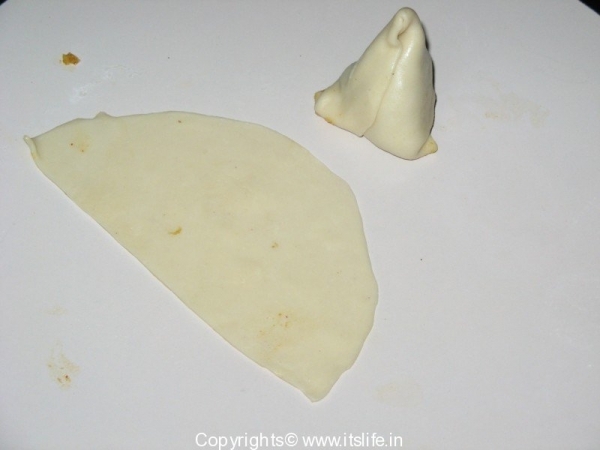 Fold the semi-circle dough into a cone. Seal the edges with the Maida paste. 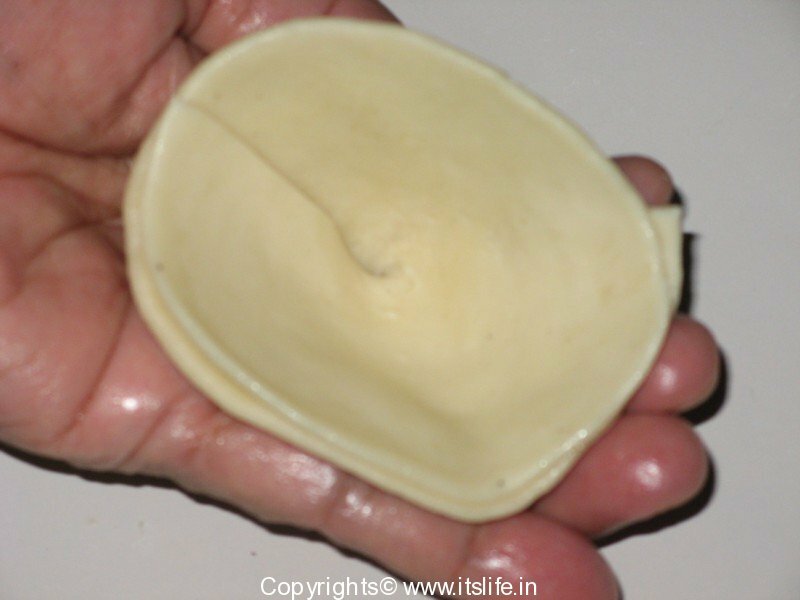 Fill the cone with the Potato filling and close the cone and again apply the maida paste to seal. Repeat for all the dough balls. Heat Oil and deep fry the Samosa until done. 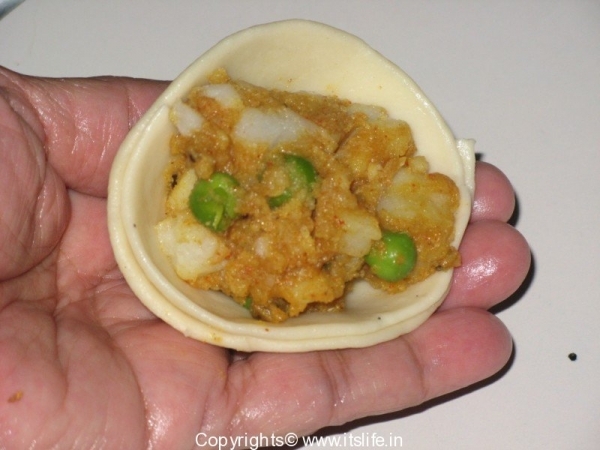 Serve with Meethi and Hara Chutney or with Tomato Ketchup. Samosas look perfect. Crispy and yummy. Samosas look well done. 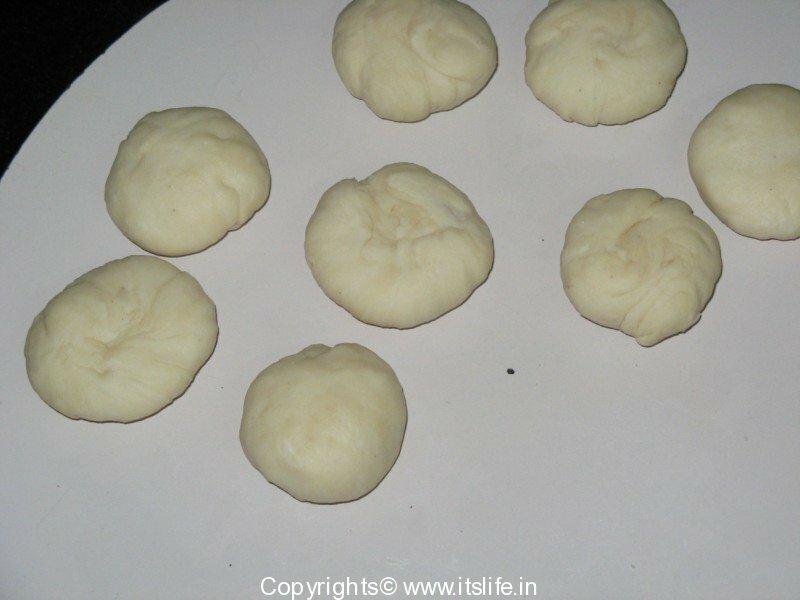 Can you please tell me how long you kneaded the dough which was used for outer covering? Thanks everyone. Beena, knead the dough for 4 minutes. Saunf is also referred to as Aniseed as the flavor is the same. The plants belong to the same family too. Anyway, in this recipe Saunf or Aniseed can be used. well, you really know how to give shape to samosa. shape tells it all. not everyone can get this shape. May i share it? It is so useful! Yes Cathy, you can share it. Lovely recipe.. thanks for sharing. I tried making samosas this evening.. the taste was perfect. However, the outer layer was slightly elastic. Do you have any tips to make it better? or does it just take practice? I am fairly new to cooking..
Hi Prathibha, Please use half teaspoon cooking soda while mixing the dough.